In space, there is no atmospheric pressure that can push you craft up or forward. In space, you can't accelerate ambient air, because there is no air there. A rocket gets its thrust from accelerating on board mass in the opposite direction. All propellant (reaction mass) is on-board. But the less mass on board the better. The harder the rocket kicks away the mass, the more thrust it gets, and the less propellant mass has to be on board. The extreme acceleration of propellant costs a lot of energy. So, it's most efficient for a rocket to have a small amount of propellant mass on board, and a lot of energy. Rockets are almost the only option for thrust in space, at this time. Alternatives are solar sails, and a gravitational slingshot. 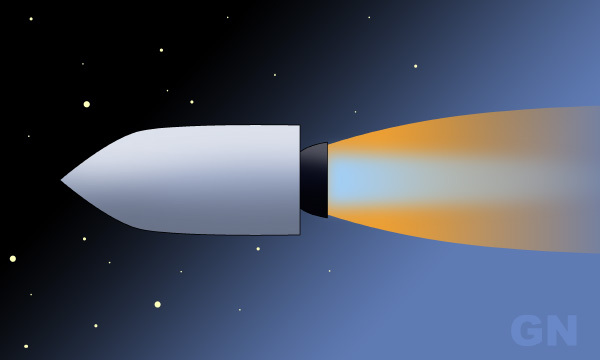 New types of rockets are being developed (like the ion drive), more efficient and reliable. But I don't think they have much future in space travel. The best property of a rocket is the lack of a good alternative. The rocket is like fighting against gravity and inertia. We should research and discover what they are, and then go with their flow. Create gravity, and change inertia. To get anywhere interesting in a reasonable time for a human, we need to discover how to travel much faster than light, if possible. If we transfer our mass into energy, or only send our information, we can reach 1x the speed of light, but again; than ain't fast enough.